Bollywood star kids are creating a niche for themselves in the industry. We have Taimur Ali Khan, Inaaya Naumi Kemmu, Laksshya Kapoor and the latest entrant is Ekta Kapoor’s Baby boy Ravie Kapoor. Sometimes, you get the feeling that these star kids are more popular than their parents. Saif Ali Khan and Kareena Kapoor’s little munchkin i.e. Taimur Ali Khan is paparazzi’s favourite and has a huge social media following. Now, Taimur was accompanying his mother Kareena on the sets of ‘Good News’. ‘Good News’ also features Akshay Kumar, Diljit Dosanjh and Kiara Advani. Kiara took to her Instagram account to post stories from the shoot. In one, she shows her morning beauty routine while in another, it is lunch time on sets. 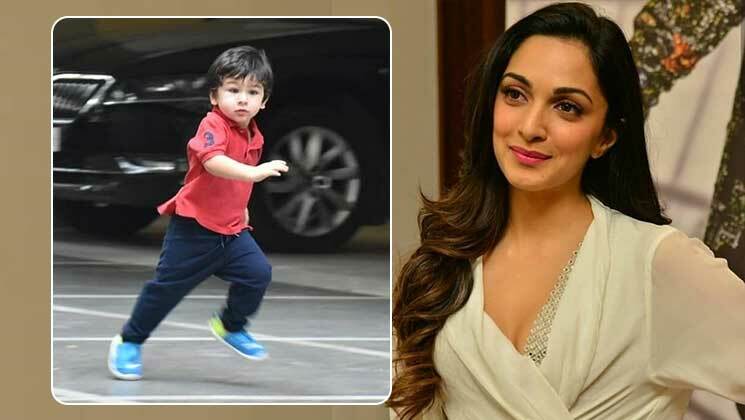 But it is the last one, a short video clip, where Kiara is seen racing with Taimur and it is so adorable. Kiara Advani is a total sport and it is so good to see actors chilling and relaxing on the sets amid work pressure. Kiara is also working alongside Shahid Kapoor in ‘Kabir Singh’, which is the Telugu remake of ‘Arjun Reddy’. Kiara, in the recent past, has come a long way and is slowly but steadily making her presence felt in the industry. Akshay Kumar will once again be teaming up with Kareena Kapoor for ‘Good News’. ‘Good News’ is scheduled to hit theatres on September 6, 2019.